During the past two decades, Chris Confer and Marco Ramirez have worked to deepen and improve mathematics instruction at schools around the country. Wherever they go, they find the raw ingredients for success already present: "The potential for positive change lies within each school. Abundance is present in the form of capable children, teachers, coaches, and principals. Potential energy—what can be—transforms into kinetic energy—what will be—only when a force is accurately applied to move a school in the right direction." 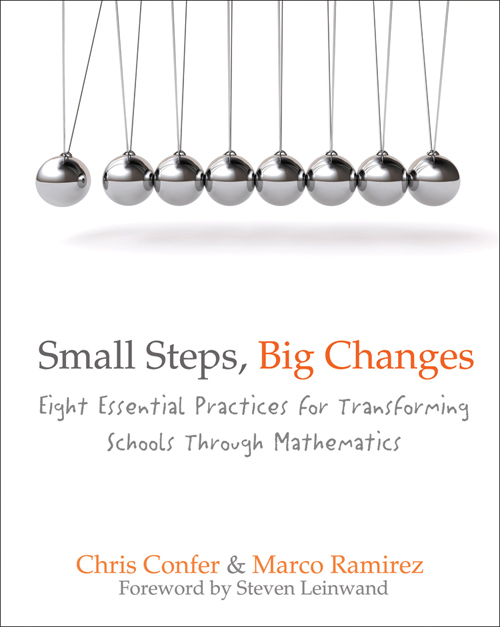 In Small Steps, Big Changes: Eight Essential Practices for Transforming Schools Through Mathematics, the authors identify eight tested principles that transform what can be an overwhelming process into a set of comprehensible and concrete steps. Each phase of the change process is brought to life through the stories and perspectives of teachers, coaches, and principals—stories that will strike familiar chords for every educator. When teachers make sense of math, students learn to make sense of math, and that can profoundly change the entire culture of a school. In one vivid illustration, the authors tell the story of Pueblo Gardens Elementary School in Tucson, Arizona, where Marco, as principal, and Chris, as instructional coach, worked alongside a group of dedicated teachers. A few years into the change process, Pueblo Gardens—a school with 96 percent of its students at the poverty level and a high percentage of English-language learners—had 94 percent of students meeting or exceeding state standards in third-grade mathematics. Over time, other grades achieved similarly high scores. And once the test scores rose, they were sustained at high levels.